The color is a very romantic and light champagne. The dress has so many layers (at least 5 layers of tulle) and you do not need a petticoat underneath. 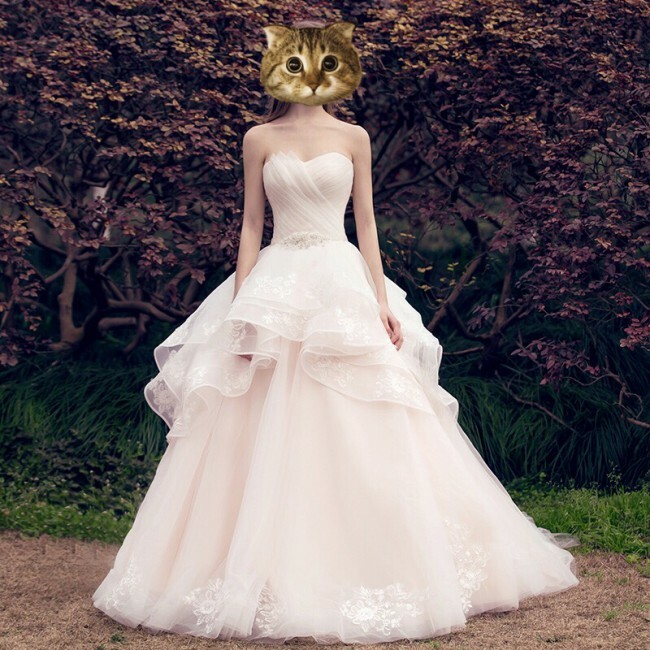 The most unique part of the dress are its tiered tulle skirt and sweetheart neckline. I shopped around almost 10 stores and this was the only ball gown with such romantic design. Even better, the back of the dress has straps so the size of the dress can be a bit flexible. There’s no alteration to the dress at all so you can alter the straps to buttons or zipper if you like. I should be either a size 6 or 8 (lost some weight before the wedding so I might be a 6 on the wedding). This dress will fit you without alternation if your bust is between 78-88cm and waist is between 64-70cm. Train is about 90cm long which I think is the perfect length. No damage on the dress at all. I only wore it once during my short reception and changed to a different dress after. If you are seriously interested in making an offer or have any questions, please get in touch. No alteration and no damage! Once you send a message, Sherry can invite you to purchase the dress.